3rd-strike.com | Are you prepared to stop the Horde of Fluffy? Are you prepared to stop the Horde of Fluffy? 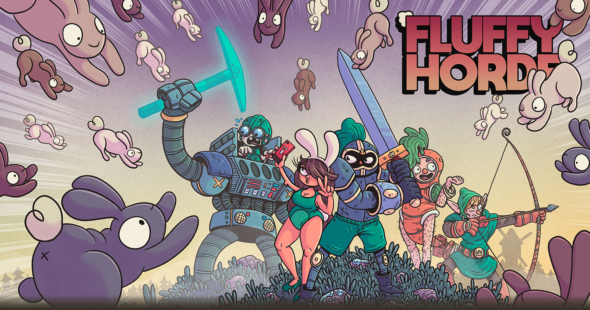 Today Turtle Juice announced the upcoming release of their latest title, Fluffy Horde. This title is all about stopping the Fluffy Horde: A magical hyper breeding bunny horde created by a misunderstood Shaman wanderer. After been rejected housing for him and his fluffy creatures in all the kingdoms, the Shaman is willing to conquer all of it by force. The gameplay is inspired by titles such as Warcraft: The Frozen Throne and Kingdom Rush. Fluffy Horde was partially funded by the Humble Bundle, winner of the Excellence in Technology award and finalist in three other categories in Gamepolitan (best narrative, best sound, best art), Winner also in SJECC for best game design and best art. Fluffy Horde will be available on PC via Steam, GOG and Humble store starting from the 7th of November 2018.